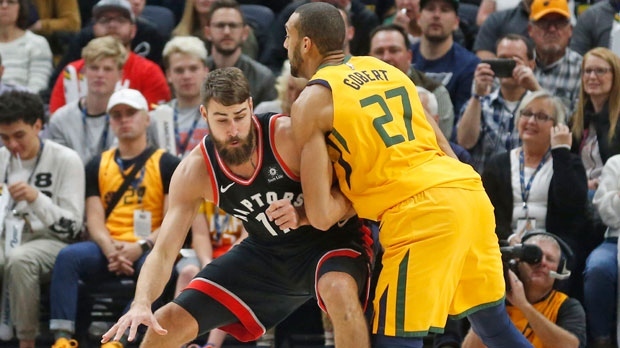 SALT LAKE CITY -- Without Kawhi Leonard, the Raptors used a balanced team effort to get their fourth straight win. "We have been playing basically position-less basketball," said Kyle Lowry, who had 17 points and 11 assists to lead four Raptors with 17 points as Toronto beat the Utah Jazz 124-111 on Monday night. "Tonight was how our offence is supposed to be played," VanVleet said. "As long as we're making shots, their defence has to respect the shooters and it allows us to play with more freedom out there." The matchup lost some lustre -- and nearly 49 points a game -- when Utah's Donovan Mitchell was ruled out with a left ankle sprain and Toronto's Leonard sat with a sore left ankle as well. But the Raptors didn't miss a beat and their offensive spacing left the court wide-open for drives. "Nobody likes to play in tight spaces, in congested spaces, so with an offence full of shooters, it's open and it's fun out there," VanVleet said. Ibaka made all eight of his shots and has made 27 of his last 29 attempts. "The guy is hot," Lowry said of Ibaka but he could have said it about a half-dozen Raptors. The point guard is certainly finding his shooters and has now posted nine consecutive games with 10 or more assists. "The little things that made us so good last year -- we haven't really done any of them to this point," Joe Ingles said. The Jazz got to the basket time and again but couldn't finish as the Raptors challenged them at the 3-point arc. Utah shot 8-of-31 from 3-point range, but that was skewed by the Jazz making three 3s in garbage time. The Jazz haven't started 0-4 at home since their inaugural season in New Orleans in 1974-75. That season, the Jazz played in the Municipal Auditorium, and lost their first six home games before finally beating Portland behind Pete Maravich's 30 points. Rick Pitino, who was fired in 2017 as Louisville's head coach, took in the game from a courtside seat within earshot of Utah coach Quin Synder. Pitino, who coached Mitchell at Louisville, was accompanied by Utah Valley University coach Mark Pope who was on his 1996 Kentucky NCAA Championship team. Raptors: Norman Powell left the game with a sprained shoulder and went straight to the locker room with 9:46 left in the second quarter. He did not return and will be evaluated on Tuesday. ... Lowry, after multiple spirited conversations with the officials, got a technical late in the third quarter. ... The Raptors outscored the jazz by 29 points in the 29 minutes Lowry was on the court. Jazz: Ingles dislocated his finger with 6:17 left in the game and did not return. ... Utah went 27-for-41 from the line while Toronto made 13 of their 14 attempts. ... Ricky Rubio had nine assists but shot 1-for-10.